* The Time Train hauled by 80072 returning to Llangollen. Photo: Liz Gill. Channel 4 TV screened the fifth and final episode of its Great Rail Restorations series on Saturday eveningy when the action shifted to operating the Time Train on the Llangollen Railway. In the off-peak period of late October 2017, Llangollen Railway made the station facilities and the railway available to the Channel 4 production team for three days to film the Time Train in action. The programme showed how three of the carriages, a four wheeler, a Royal Saloon and a Pullman car, spanning 100 years of railway operations, were brought by low loader from their restoration bases at Isle of Wight, Embsay and Tyseley to join the Great Northern coach at Llangollen. This unique formation of four carriages was then filmed operating on the Dee Valley line between Llangollen and Carrog with members of each restoration team on board to sample and compare the results of all their hard work. They enjoyed lunch served in the Pullman coach as a celebration of a remarkable effort to meet the challenge set by the TV producers. Speaking about the restoration of the Great Northern coach at Llangollen the owner, Peter Lund, said: “The restoration of this 1912 teak bodied coach was a gargantuan task. At every stage more work than had been anticipated was revealed to rebuild the interior. The train was taken down the line by the Standard Tank No.80072 with presenter Peter Snow in the driver’s seat, as he lived the dream of a lifetime driving a steam engine. He was under the careful supervision of Llangollen Railway driver Paul Reynolds from Chester and fireman Graham Hoyland from Abergele. If there is a second star in the programme, it is the No.80072 as it is seen steaming past Berwyn and through the autumnal scenes along the railway line to Carrog. Liz McGuinness, Llangollen Railway chairman, said: “Llangollen Railway members are brimming with pride after the final part of the Great Rail Restorations project. "The stunning views of the river Dee at Llangollen and the Dee Valley are amazing and a great promotional opportunity for the region. 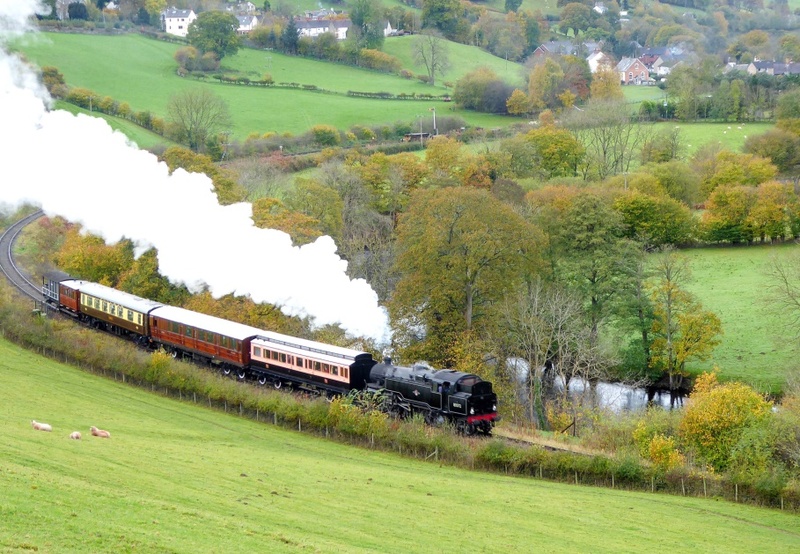 “The volunteers and employees are thrilled with the programme and the promotion it offered for the railway's setting, its ability to operate the heritage train and the efforts of all those involved. * The Great Northern coach. * The Isle of Wight four-wheeler. * The Pullman coach Eagle.